Pasadena – Lake and Del Mar Surveillance & ITS Design – Advantec Consulting Engineers, Inc. 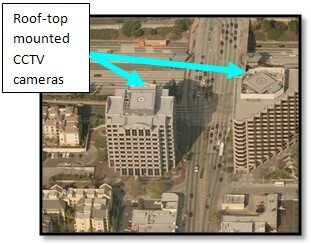 This project was an ITS project that included four (4) intersection CCTV cameras, two (2) CCTV cameras mounted on top of a building, a Changeable Message Sign and Fiber Optic Interconnect design. The cameras that are mounted on top of a building required a special design to have conduit go up along the building starting from the communication room and end at the CCTV’s on top of the building with a special bracket that was called out in the specifications of this project. The CMS was designed with advanced equipment capabilities like wireless communication that the City could utilize in the future. The fiber optic design included the installation of Single Mode Fiber Optics and also the conversion of Single Mode to Multi Mode fiber optic in order to accommodate the existing city infrastructure. This project not only included the designs of these various ITS equipment, it also included the research of any new equipment that the City could benefit from.